Colombia is in the north west of South America. It is bordered by Panama, Ecuador, Peru, Brazil, and Venezuela. Santa Marta was settled by 1525, Colombia was established as a Spanish colony in 1549, although at that time, and until 1861, it was called Nueva Granada or New Granada. Independence was declared in 1810 , and secured in 1819 when Simon Bolivar united Colombia, Venezuela, Panama and Ecuador as the Republic of Gran Colombia, although Venezuela withdrew in 1829, Ecuador in 1830, and Panama in 1903. Interestingly, we have always pronounced the name of the country "Columbia", not Colombia as it is spelt, but the certificate accompanying the 1973 coin set spells it as Columbia. Apart from coffee and cocaine, Colombia has resources of precious metals including platinum and gold. 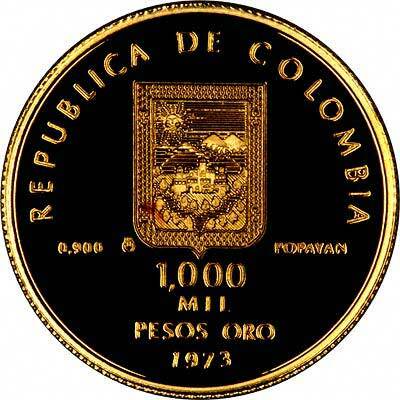 It is natural therefore that Colombia has a long history of issuing gold coins. Its earliest gold coins were escudos in various multiples because of its Spanish heritage, but from about 1821, its main denomination was the peso. 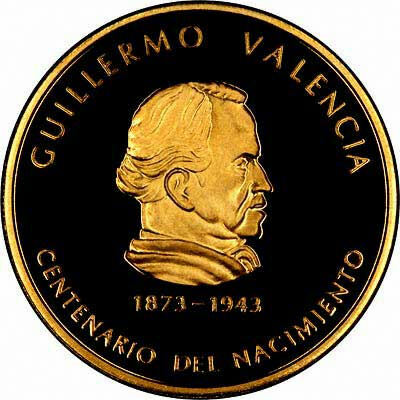 Colombia in common with most latin american countries has experienced inflation, so that it has issued gold coins with a denominations as low as 1 peso, and as high as 100,000 pesos. For silver and base metal coins of Colombia, please look at our original Chard Coins website.